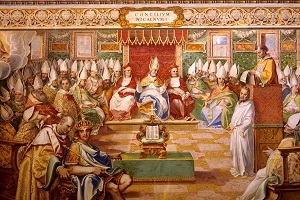 As stated, the First Council of Nicaea dealt primarily with the issue of the deity of Christ. In Nicaea, questions regarding the Holy Spirit were left largely unaddressed until after the relationship between the Father and the Son was settled. So the doctrine in a more full-fledged form was not formulated until the Council of Constantinople in 360 AD, and a final form formulated in 381 AD, primarily crafted by Gregory of Nyssa. All original records of the Constantinople Council are lost, thus Gregory's doctrine may not have been part of the council's approved doctrine. The Niceno-Constantinopolitan Creed has been associated with the Council of Constantinople (381). It is roughly equivalent to the Nicene Creed plus two additional articles: an article on the Holy Spirit—describing Him as "the Lord, the Giver of Life, Who proceeds from the Father, Who with the Father and the Son is worshipped and glorified, and Who spoke through the prophets". Scholars are not in agreement on the connection between the Council of Constantinople and the Niceno–Constantinopolitan Creed. Some modern scholars believe that this creed, or something close to it, was stated by the bishops at Constantinople, but not promulgated as an official act of the council. Scholars also dispute whether this creed was simply an expansion of the Creed of Nicaea, or whether it was an expansion of another traditional creed similar but not identical to the one from Nicaea. Gregory was bishop of Nyssa from 372 to 376 and from 378 until his death. Gregory, his elder brother Basil of Caesarea, and their friend Gregory of Nazianzus are collectively known as the Cappadocian Fathers. Gregory, following Basil, defined the Trinity as "one essence in three persons", their formula adopted by the Council of Constantinople in 381 or inserted by Gregory. According to Gregory, the differences between the three persons of the Trinity reside in their relationships with each other, and the triune nature of God is revealed through divine action, despite the unity of God in his action. They certainly drew upon earlier sources, such as Origen and Tertullian, as the term "Trinity" (Τριάς in Greek; trinitas in Latin) was used in the writings of Origen and Tertullian, and a general notion of a "divine three". 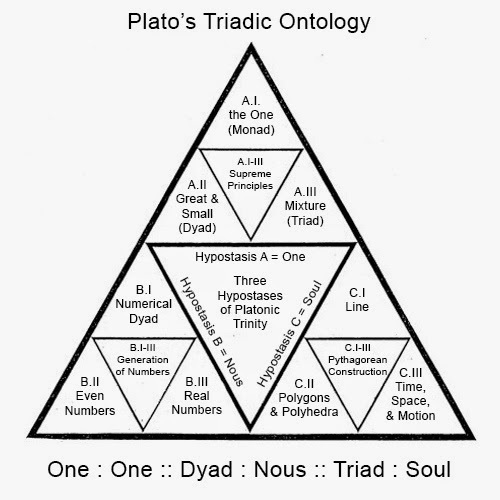 Origen (185–254) begins his treatise On First Principles by establishing, in typical Platonic fashion, a divine hierarchical triad; but instead of calling these principles by typical Platonic terms like monad, dyad, and world-soul, he calls them "Father," "Christ," and "Holy Spirit," though he does describe these principles using Platonic language. The first of these principles, the Father, is a perfect unity, complete unto Himself, and without body - a purely spiritual mind. Since God the Father is, for Origen, "personal and active," it follows that there existed with Him, always, an entity upon which to exercise His intellectual activity. This entity is Christ the Son, the Logos, or Wisdom (Sophia), of God, the first emanation of the Father, corresponding to Numenius' "second god," as we have seen above. The third and last principle of the divine triad is the Holy Spirit, who "proceeds from the Son and is related to Him as the Son is related to the Father". The God and Father, who holds the universe together, is superior to every being that exists, for he imparts to each one from his own existence that which each one is; the Son, being less than the Father, is superior to rational creatures alone (for he is second to the Father); the Holy Spirit is still less, and dwells within the saints alone. So that in this way the power of the Father is greater than that of the Son and of the Holy Spirit, and that of the Son is more than that of the Holy Spirit, and in turn the power of the Holy Spirit exceeds that of every other holy being. Tertullian (160-220) is perhaps most famous for being the first writer in Latin known to use the term trinity (Latin: trinitas). According to The Stanford Encyclopedia of Philosophy, "Tertullian's trinity [is] not a triune God, but rather a triad or group of three, with God as the founding member". A similar word had been used earlier in Greek, though Tertullian gives the oldest extant use of the terminology as later incorporated into the Nicene Creed at the 2nd Ecumenical Council, the First Council of Constantiniple in 381 AD, or as the Athanasian Creed, or both. Other Latin formulations that first appear in his work are "three persons, one substance" as the Latin "tres personae, una substantia", (' consubstantial ', in English), itself from the Koine Greek "treis hypostases, homoousios "). Influenced by Stoic philosophy, the "substance" of Tertullian, however, was a material substance that did not refer to a single God, but to the sharing of a portion of the substance of the Father (the only being who was fully God) with the Son and, through the Son, with the Holy Spirit. He wrote his understanding of the three members of the trinity after becoming a Montanist. At this point we must segue back to the Stoic philosophy as another source for the trinitas concept. * The third man argument (commonly referred to as TMA) was offered by Plato in the Parmenides, is a criticism of Plato's own theory of forms. This argument was furthered by Aristotle in his Metaphysics by using the example of a man (hence the name of the argument) to explain this objection to Plato's theory; he posits that if a man is a man because he partakes in the form of man, then a third form would be required to explain how man and the form of man are both man, and so on, ad infinitum.